Surrounded by ants in the bath-basin ... a fight to the death! They are not getting any of my water except what I flush them down the drain with! The spout off the porch roof would make a wonderful shower ... think I'll ask the Lord to heat it a bit! 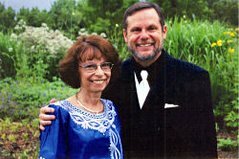 Of course that may not be a good "missionary" connection with the neighbors! David is out washing his hair [photo at right. 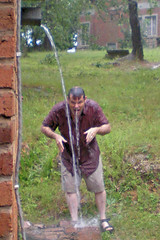 Click the photo to see it and the other rain-related ones] while collecting water in buckets at the roof spout. I think we should just soap him down and then he could have a bath and we could wash his clothes at the same time! Just think of the millions of people who have no close water supply or it is a dirty shallow well. They walk miles carrying buckets, basins, or any containers that will work ... tied to their bicycles, their backs, on their heads ... with always a line to wait through! We are so Fortunate! that we have the good well and the rain here at Mulungwishi! Pray for others and the many leaders of nations who do not see these issues as important and may it also challenge us to use water wisely. Pray for more rain!